All transactions are safe and secure with a reliable history in online purchasing behind each of our associates. 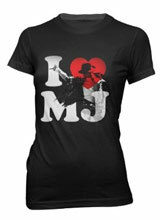 Buy the I Heart MJ Michael Jackson t-shirt to own Michael Jackson clothing and merchandise. This popular I Love Michael Jackson tee includes the star himself. Michael was a huge fan of the movie E.T. The Extra-Terrestrial and its little green star. He recorded the song "Someone in the Dark" for the movie's soundtrack album and he even narrated a condensed version of the movie's story on his record Michael Jackson The E.T. Storybook. The special MJ album included a Michael Jackson poster that displayed a photo of the singer with the movie character E.T. Wear this piece of MJ merchandise underneath your authentic Michael Jackson thriller jacket to create the perfect Thriller costume. In addition to the I Heart MJ Michael Jackson tee above, browse the Michael Jackson Clothing Gallery for more apparel like men's and women's clothes, kids shirts or hoodies.